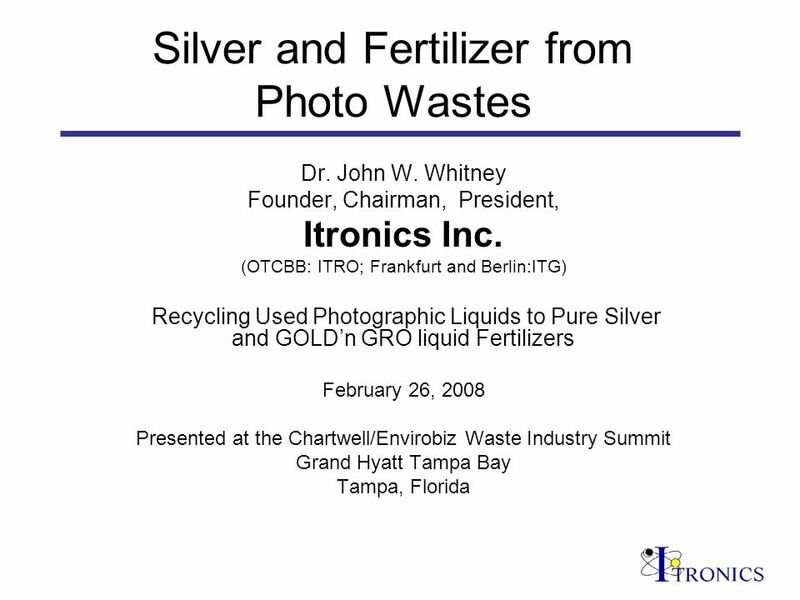 Silver and Fertilizer from Photo Wastes Dr. John W. Whitney Founder, Chairman, President, Itronics Inc. (OTCBB: ITRO; Frankfurt and Berlin:ITG) Recycling. 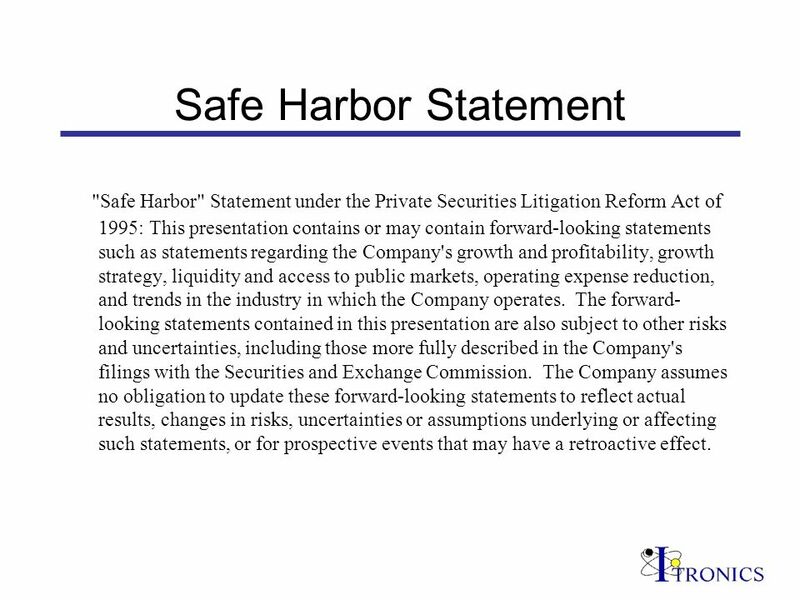 2 Safe Harbor Statement "Safe Harbor" Statement under the Private Securities Litigation Reform Act of 1995: This presentation contains or may contain forward-looking statements such as statements regarding the Company's growth and profitability, growth strategy, liquidity and access to public markets, operating expense reduction, and trends in the industry in which the Company operates. 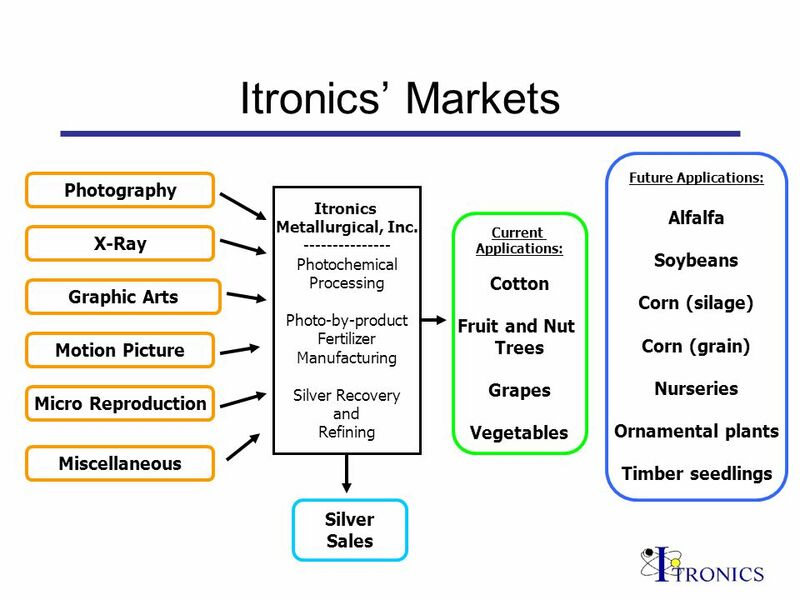 The forward- looking statements contained in this presentation are also subject to other risks and uncertainties, including those more fully described in the Company's filings with the Securities and Exchange Commission. 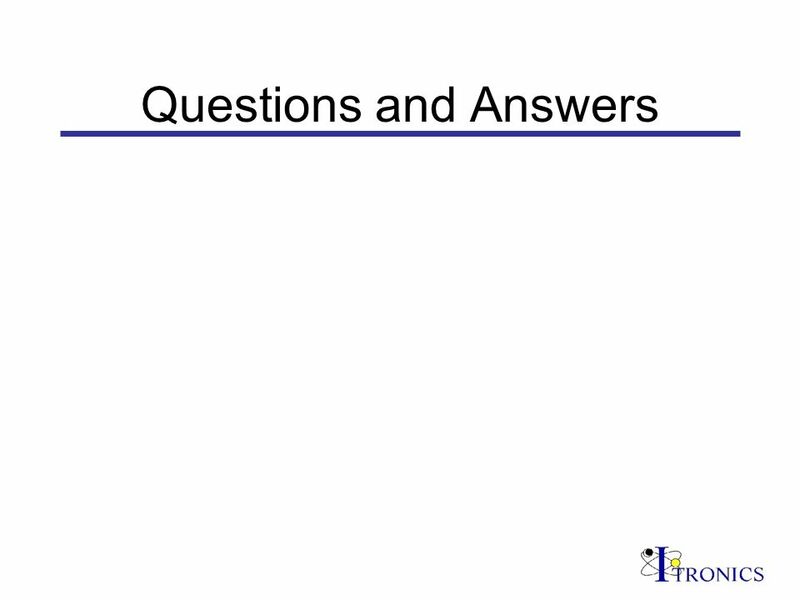 The Company assumes no obligation to update these forward-looking statements to reflect actual results, changes in risks, uncertainties or assumptions underlying or affecting such statements, or for prospective events that may have a retroactive effect. 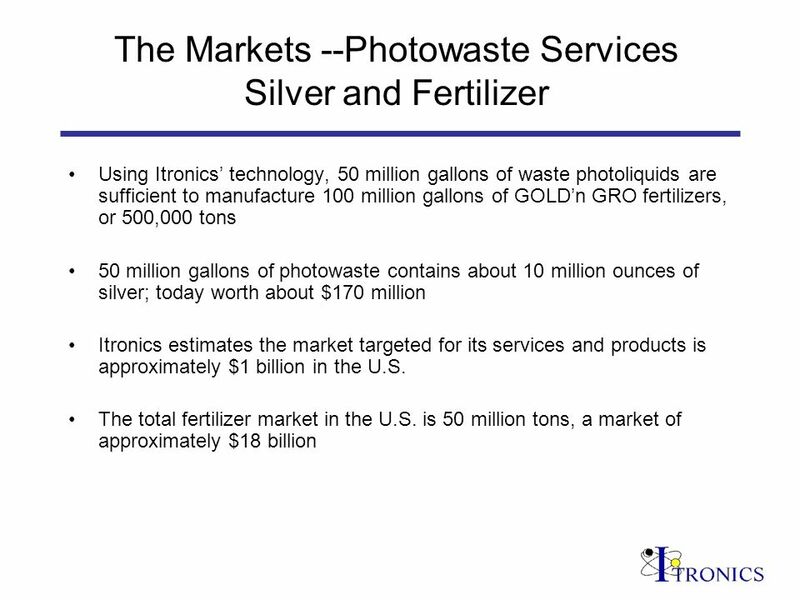 5 The Markets -- Photowaste Services, Silver, and Fertilizer The U.S. Environmental Protection Agency says silver bearing photoliquids were a 100 million gallon toxic waste stream in the U.S.; today 50 million. 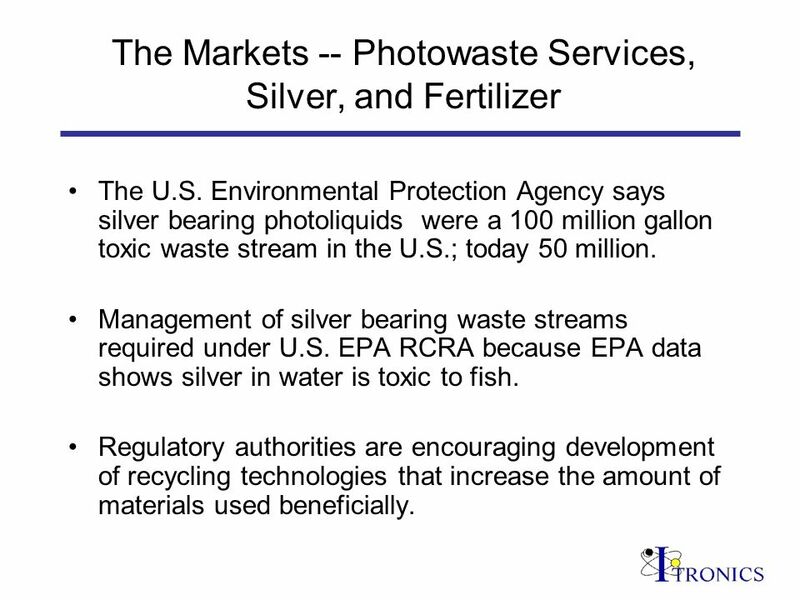 Management of silver bearing waste streams required under U.S. EPA RCRA because EPA data shows silver in water is toxic to fish. 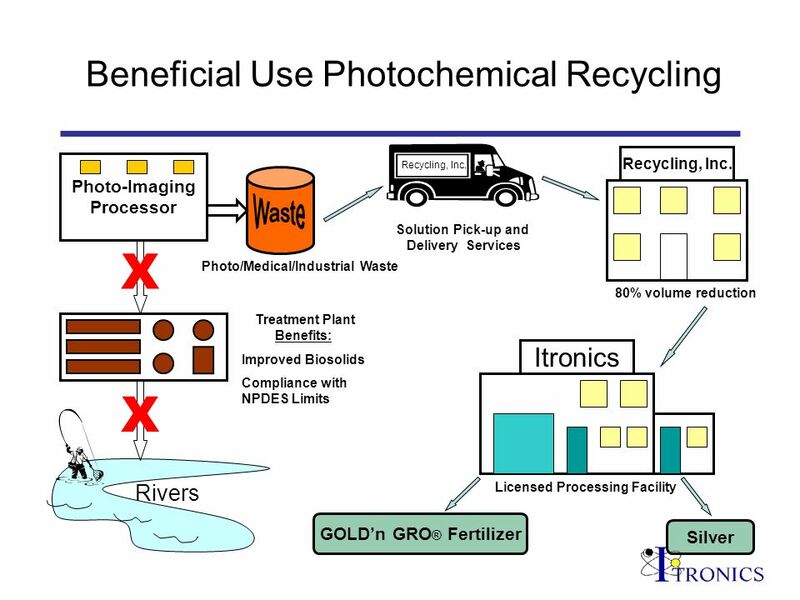 Regulatory authorities are encouraging development of recycling technologies that increase the amount of materials used beneficially. 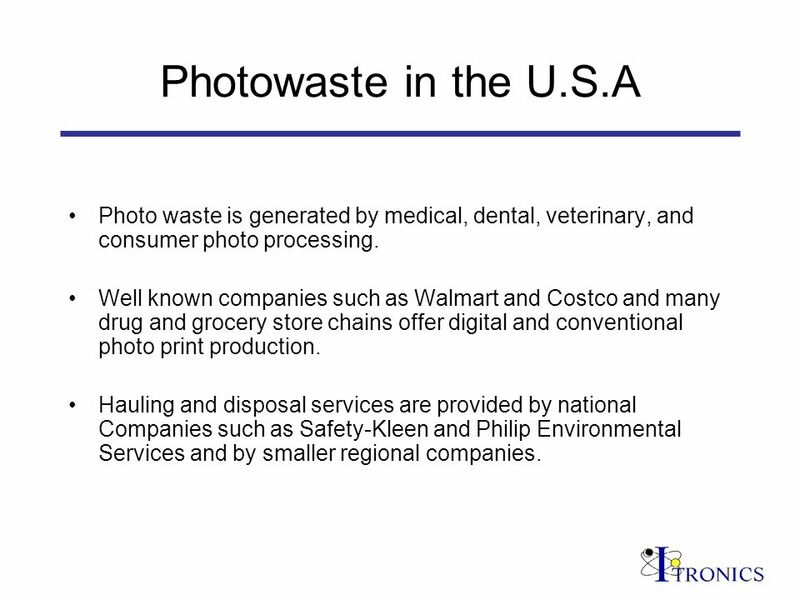 7 Photowaste in the U.S.A Photo waste is generated by medical, dental, veterinary, and consumer photo processing. 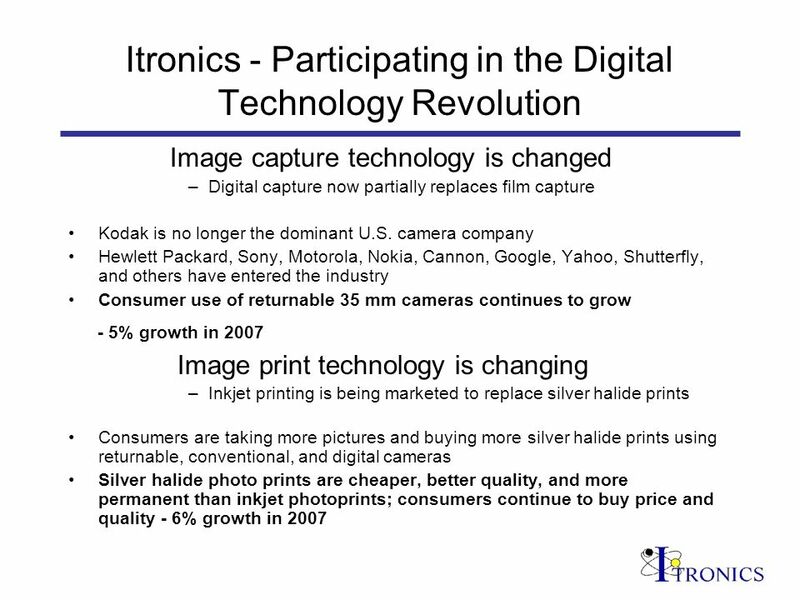 Well known companies such as Walmart and Costco and many drug and grocery store chains offer digital and conventional photo print production. Hauling and disposal services are provided by national Companies such as Safety-Kleen and Philip Environmental Services and by smaller regional companies. 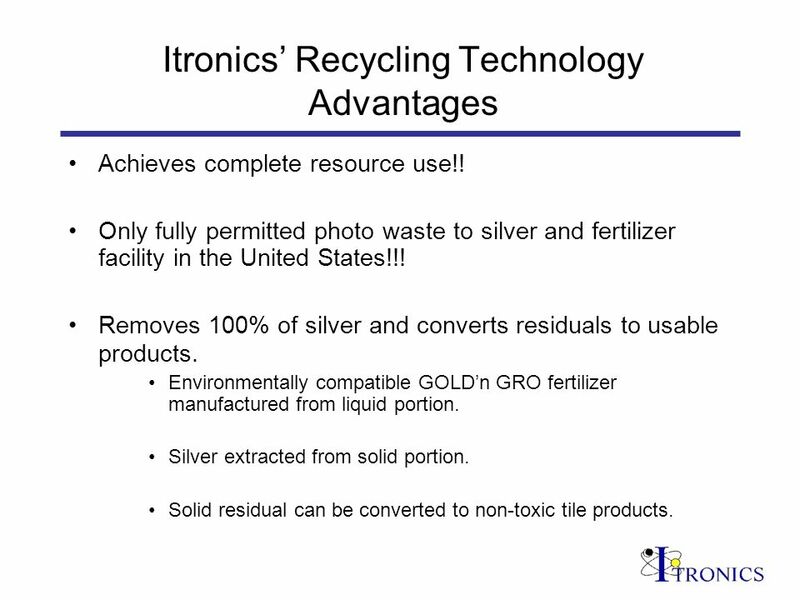 9 Itronics Recycling Technology Advantages Achieves complete resource use!! 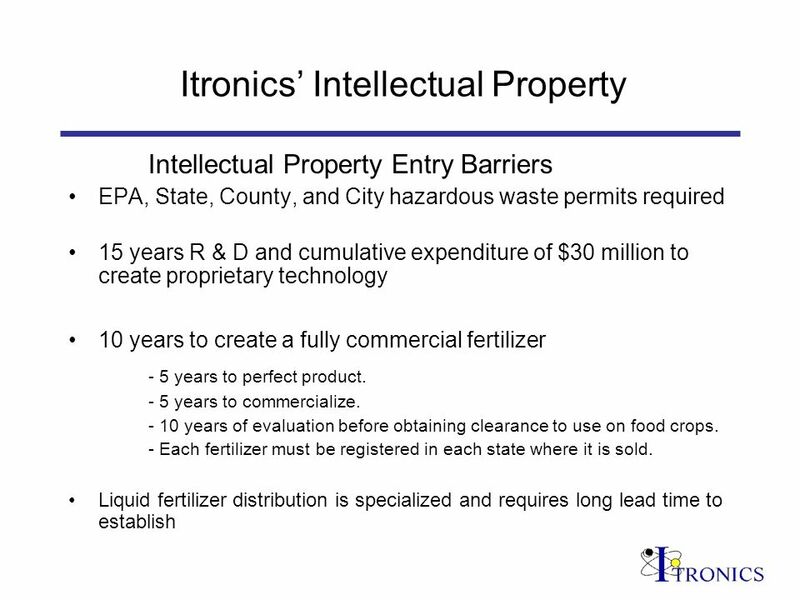 Only fully permitted photo waste to silver and fertilizer facility in the United States!!! 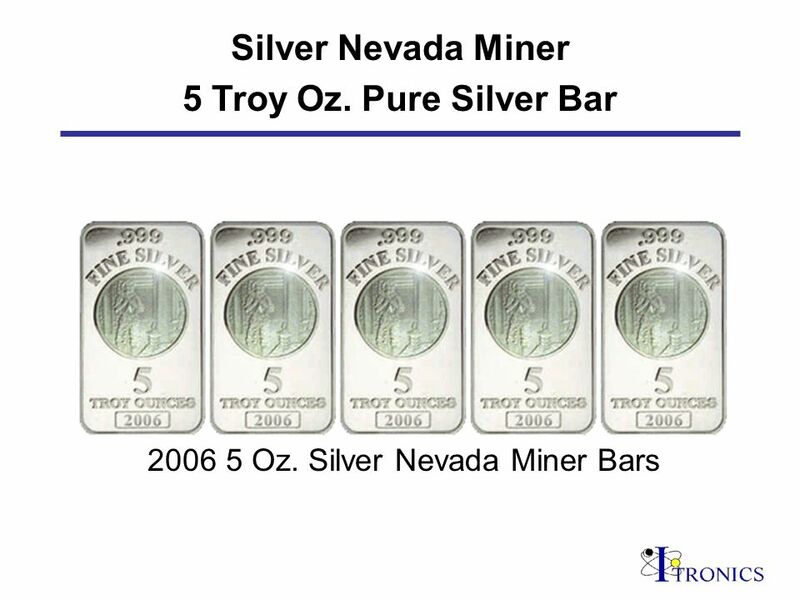 Removes 100% of silver and converts residuals to usable products. 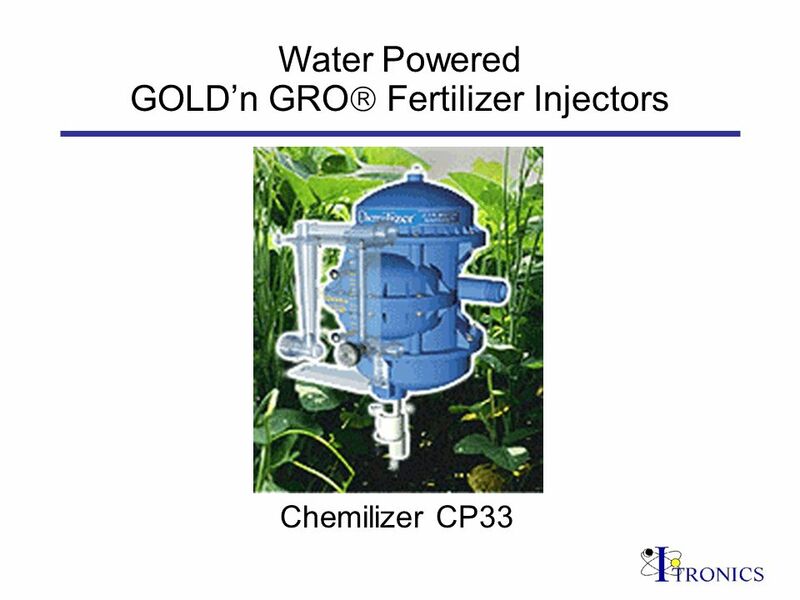 Environmentally compatible GOLDn GRO fertilizer manufactured from liquid portion. 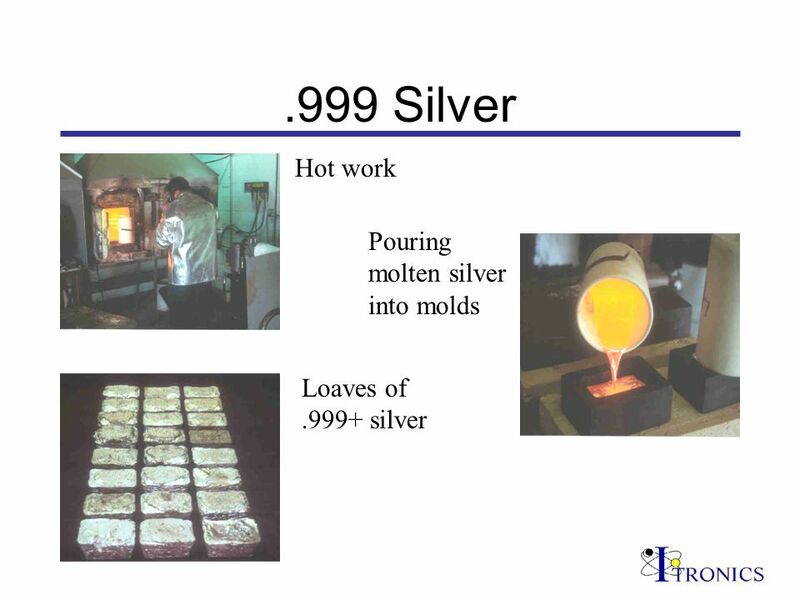 Silver extracted from solid portion. 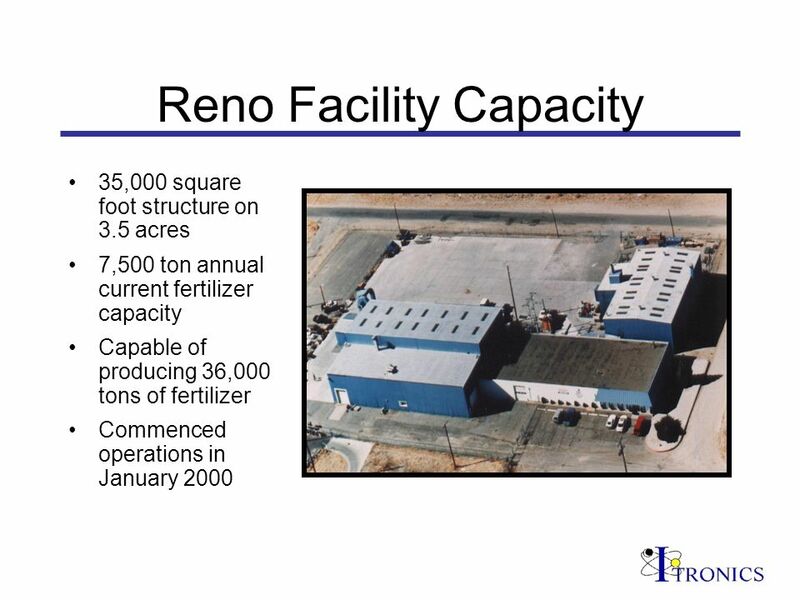 Solid residual can be converted to non-toxic tile products. 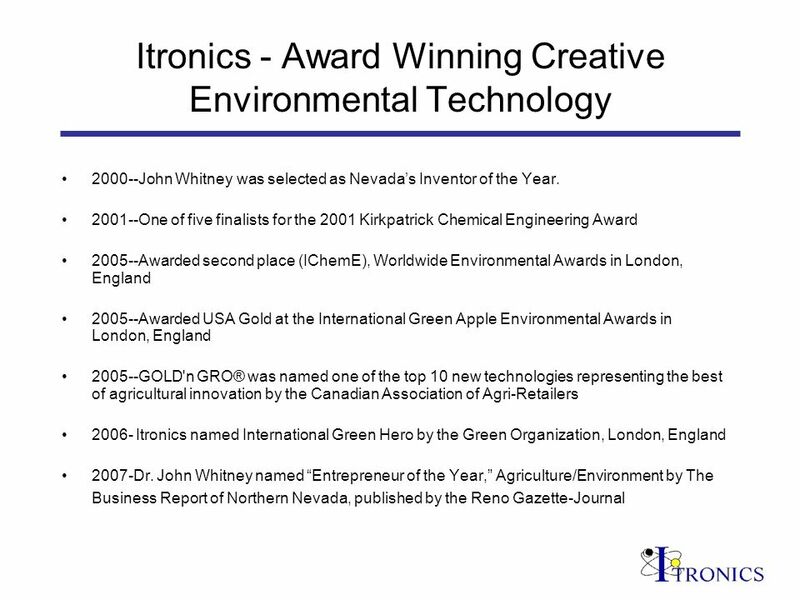 16 Itronics Recycling Services Sales Model Selling photowaste management services –Retail services to all categories of small and large photo facilities in northern Nevada and California Selling Photochemical Waste Water Treatment Units and sludge processing service to large military, medical, and consumer photo processing facilities throughout the U.S. Wholesale photo liquid recycling to medium and large environmental service companies throughout the U.S. Two large service contracts signed in fall 2006. Negotiating additional agreements in 2008. 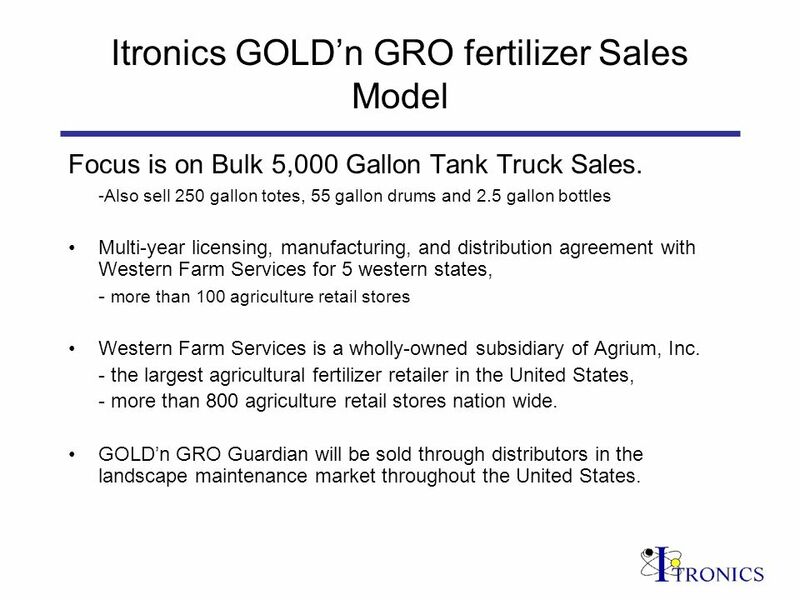 19 Itronics GOLDn GRO fertilizer Sales Model Focus is on Bulk 5,000 Gallon Tank Truck Sales. 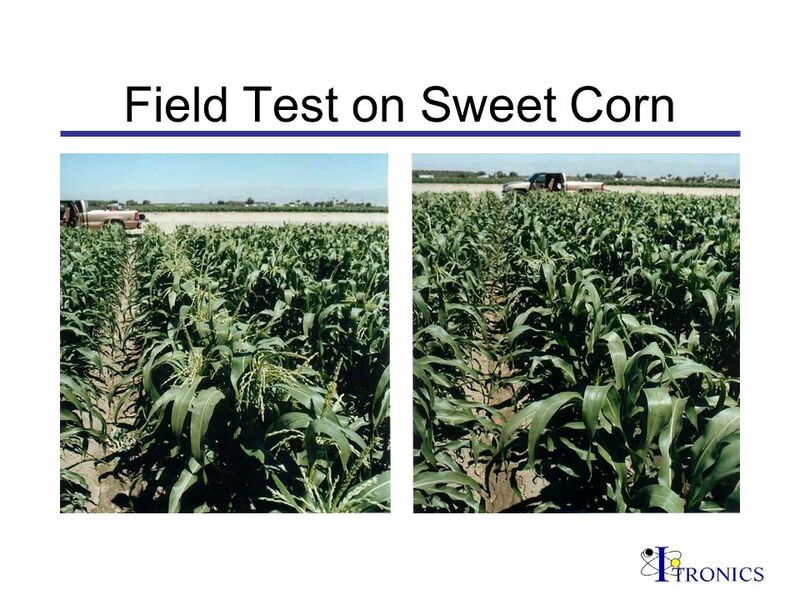 -Also sell 250 gallon totes, 55 gallon drums and 2.5 gallon bottles Multi-year licensing, manufacturing, and distribution agreement with Western Farm Services for 5 western states, - more than 100 agriculture retail stores Western Farm Services is a wholly-owned subsidiary of Agrium, Inc. - the largest agricultural fertilizer retailer in the United States, - more than 800 agriculture retail stores nation wide. 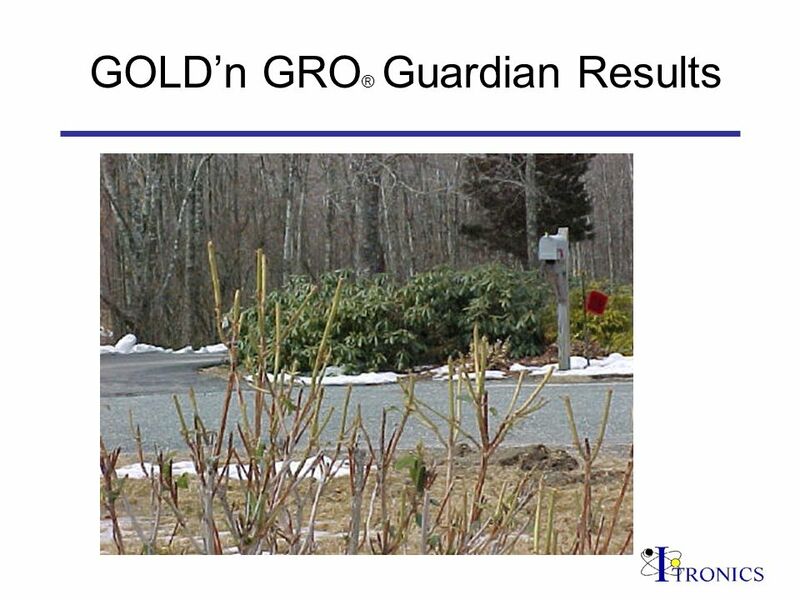 GOLDn GRO Guardian will be sold through distributors in the landscape maintenance market throughout the United States. 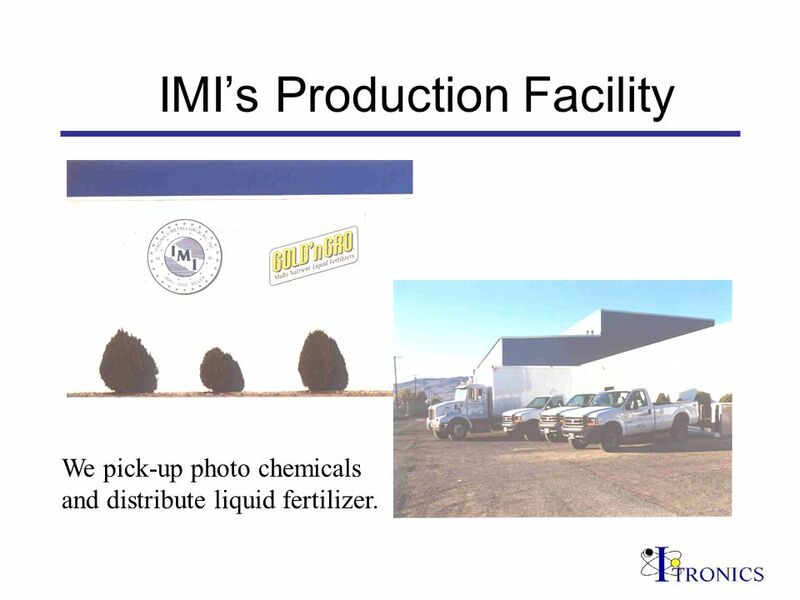 21 IMIs Production Facility We pick-up photo chemicals and distribute liquid fertilizer. 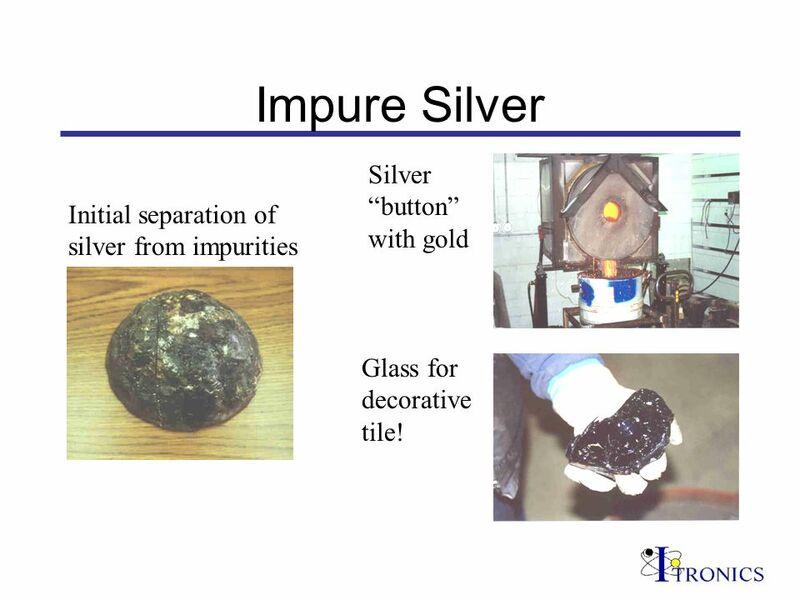 22 Impure Silver Initial separation of silver from impurities Silver button with gold Glass for decorative tile! 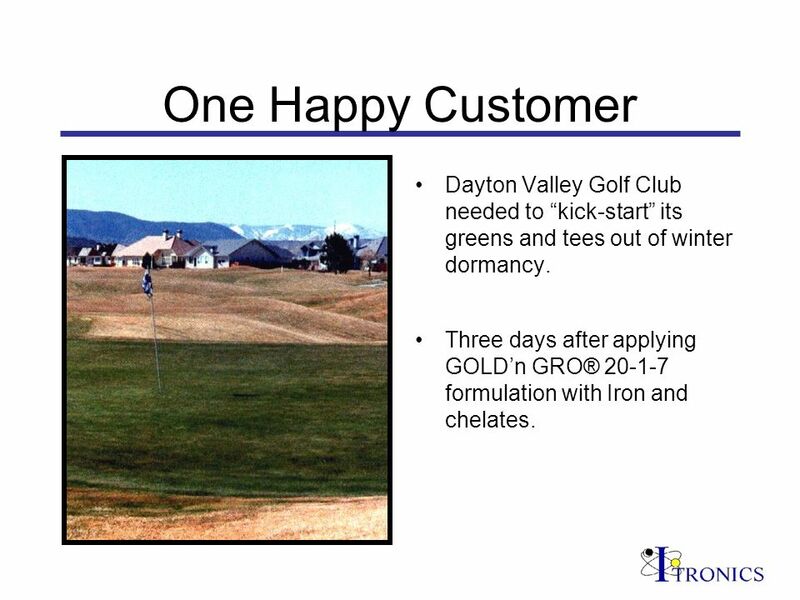 31 One Happy Customer Dayton Valley Golf Club needed to kick-start its greens and tees out of winter dormancy. 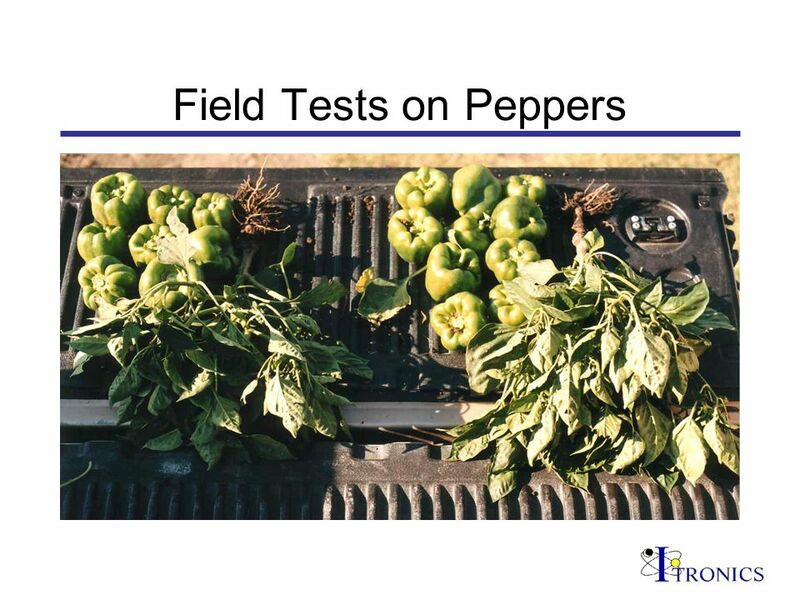 Three days after applying GOLDn GRO® 20-1-7 formulation with Iron and chelates. 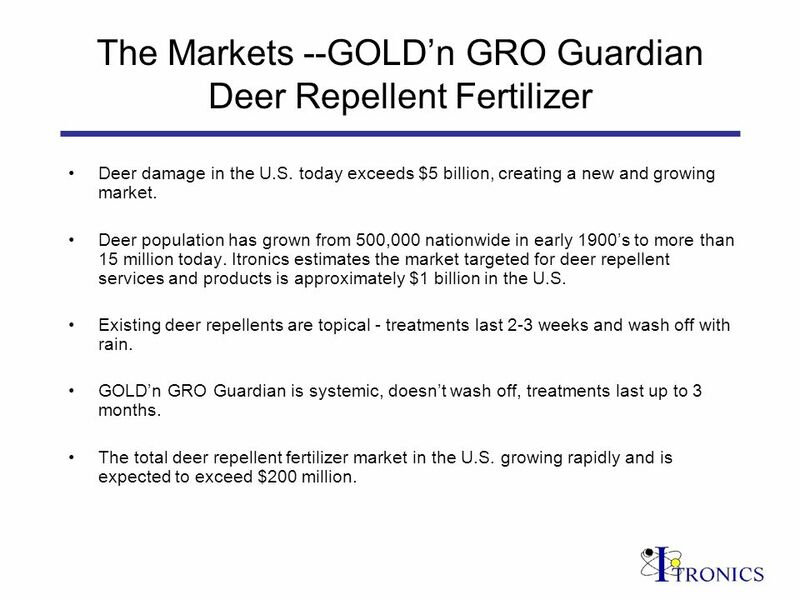 32 The Markets --GOLDn GRO Guardian Deer Repellent Fertilizer Deer damage in the U.S. today exceeds $5 billion, creating a new and growing market. Deer population has grown from 500,000 nationwide in early 1900s to more than 15 million today. 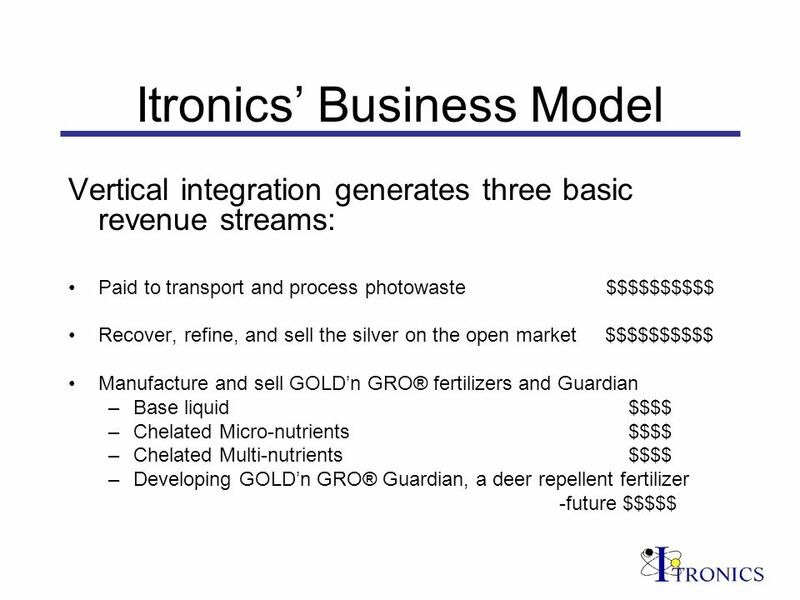 Itronics estimates the market targeted for deer repellent services and products is approximately $1 billion in the U.S. 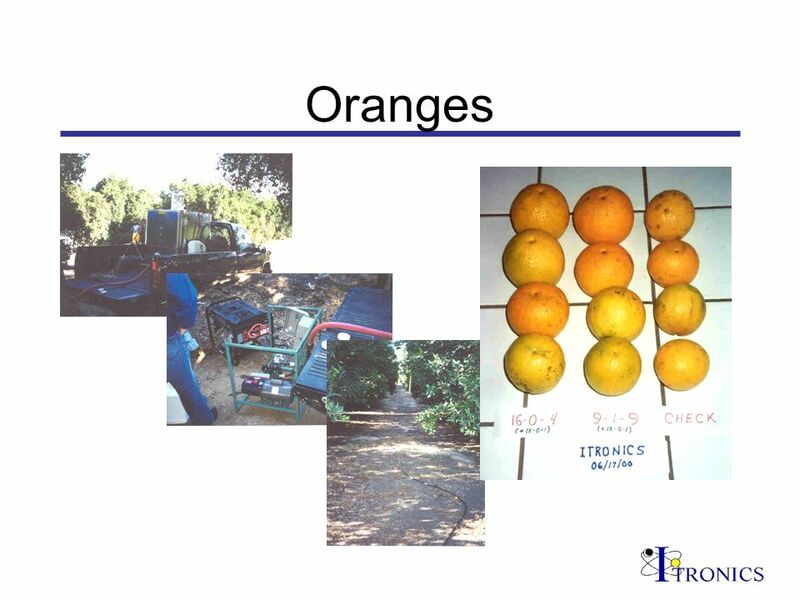 Existing deer repellents are topical - treatments last 2-3 weeks and wash off with rain. 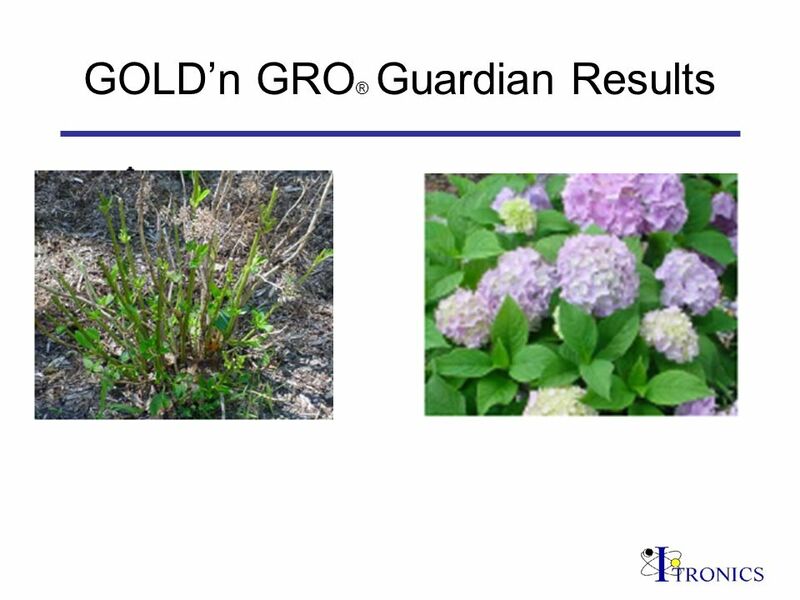 GOLDn GRO Guardian is systemic, doesnt wash off, treatments last up to 3 months. 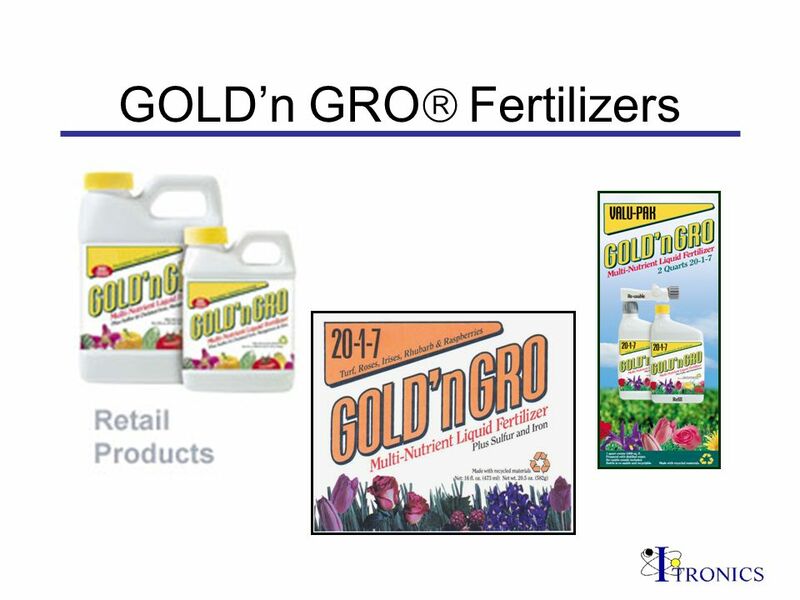 The total deer repellent fertilizer market in the U.S. growing rapidly and is expected to exceed $200 million. 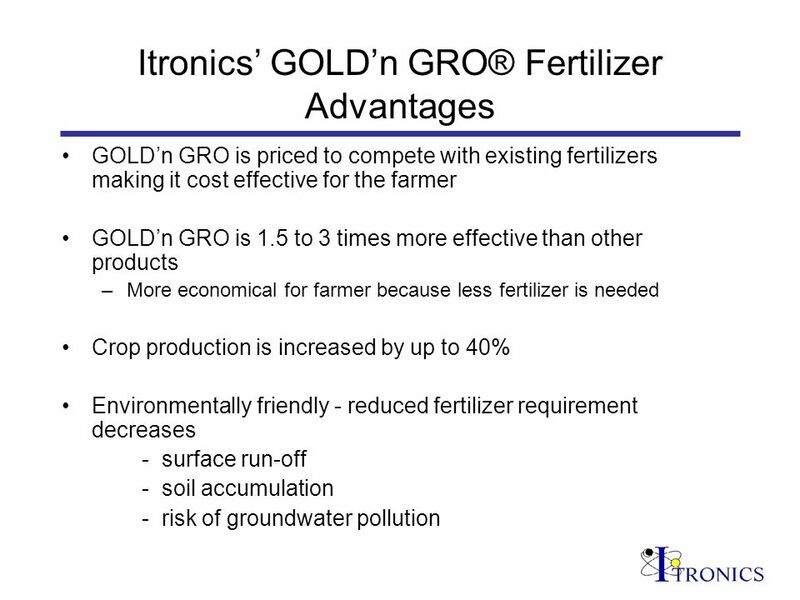 35 Itronics GOLDn GRO Fertilizer Divison Sales are Expanding Sales up 25% for full year 2007 at $2.3 million. 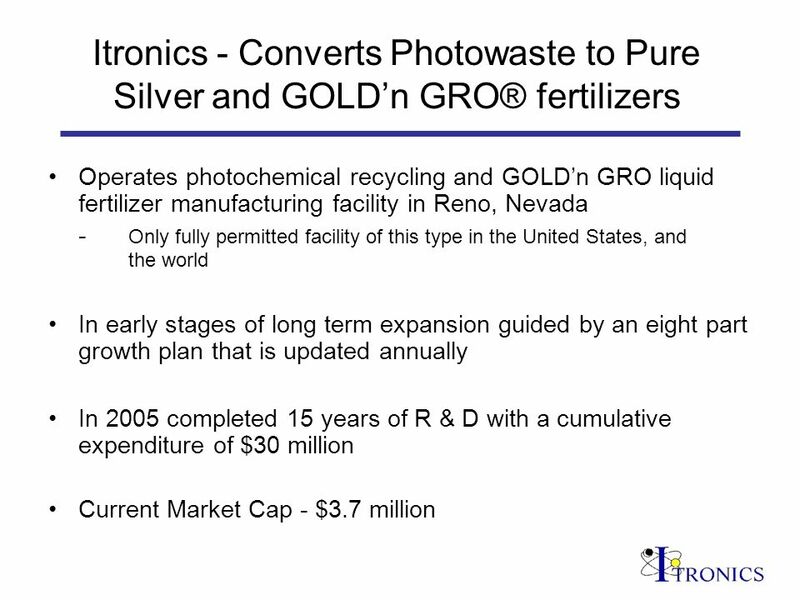 Positive gross profit for full year 2007. 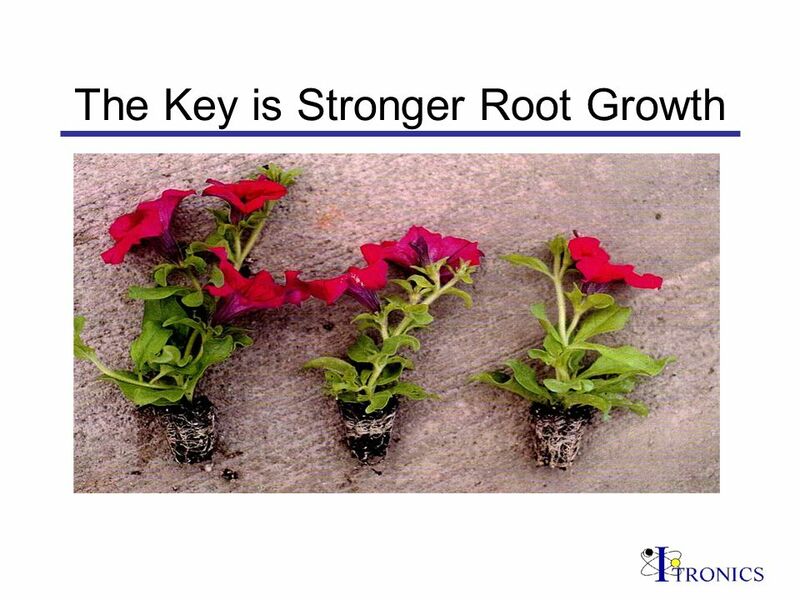 Expect sales to increase in 2008 to about $4 million. 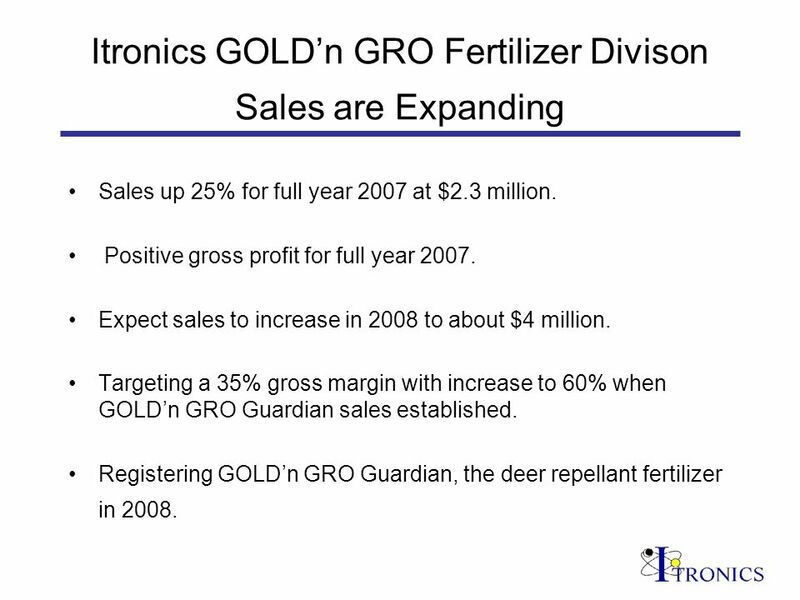 Targeting a 35% gross margin with increase to 60% when GOLDn GRO Guardian sales established. 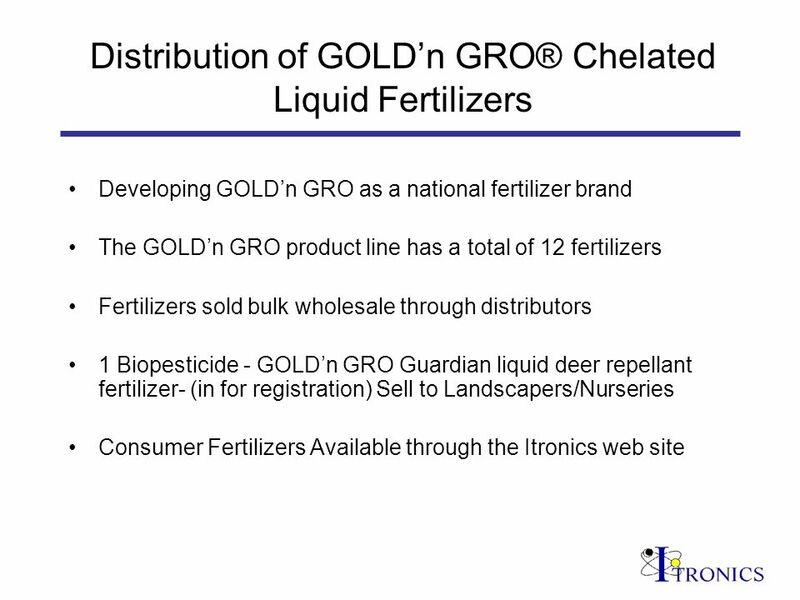 Registering GOLDn GRO Guardian, the deer repellant fertilizer in 2008. 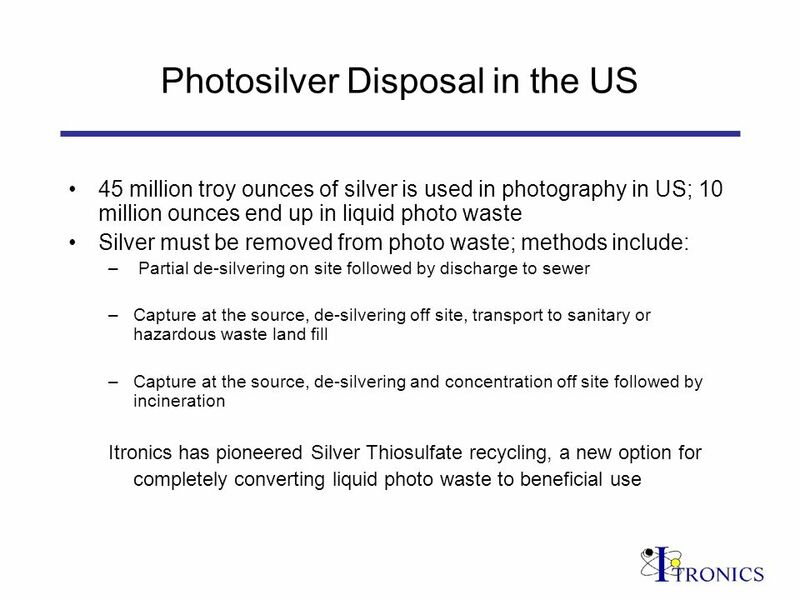 Download ppt "Silver and Fertilizer from Photo Wastes Dr. John W. Whitney Founder, Chairman, President, Itronics Inc. (OTCBB: ITRO; Frankfurt and Berlin:ITG) Recycling." Steve True, Finance Director Sapa Profiles UK 7 th November 2006. Agreement between the Village of Owego and Inflection Energy. 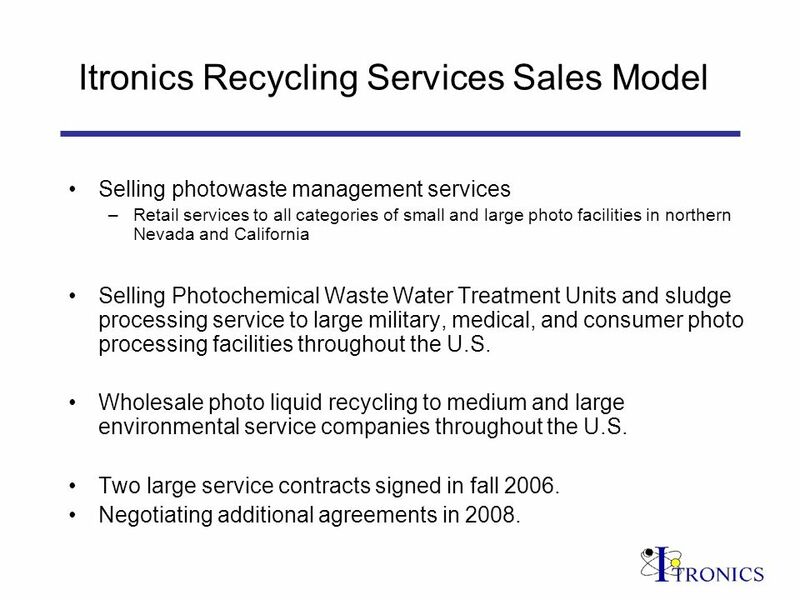 End Use Planning Strategy Turnkey Recycling & Environmental Enterprise (T.R.E.E.) 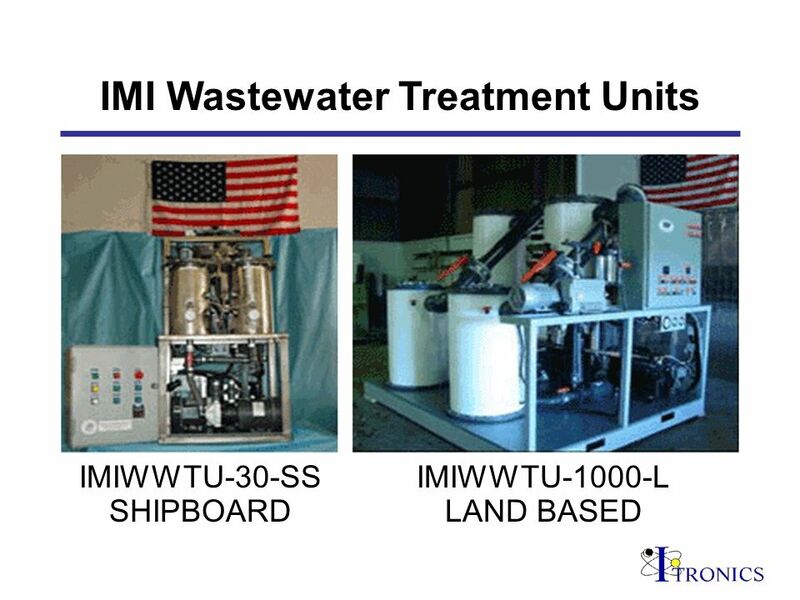 Rochester, NH Waste Management of NH, Inc. Steve Poggi, P.E. Waste Oil Wagon Waste Vegetable Oil Collection Service Jerry Robock and Josh Levin. PRETON PRESENTATION PRINT COST SAVING (PCS) TECHNOLOGY PRETON - PRINT AND SAVE February 2006.